The moment I saw Ayden I fell in love. A love that is indescribable, and irreplaceable. It’s a moment in time where you learn to no longer think of yourself and your dreams; your dream now becomes to be a parent and for me a mother. Being a mother means to protect and love your child. To never let them feel any type of pain if you can prevent it. It is my job to open every door possible for this little boy to ensure his success in this world. The moment I saw Ayden was the first day I really ever felt alive. Ayden was born August 20,2014. I waited 18 hours for Ayden to come out, and he never did. We had to cut him out. I never felt one ounce of pain giving birth to Ayden not one contraction. When I brought him home I had to stare at him for a long time each day just so it could sink in that I had my own little boy. I love everything about being a mother. I love giving him baths, singing to him, teaching him about the world, but most of all I love watching him grow. My son is the beat that keeps my heart alive, and this is our story. It all started around the month of September. I came home from work on my lunch break and saw Ayden playing with some toys in the hall. I ran over to greet him and I noticed that he was breathing pretty hard. I asked my mother if he had been running around a lot, but she said he hadn’t. In the past Ayden had received breathing treatments, so I assumed that maybe that is what he needed. So I scheduled an appointment with his pediatrician for that same day. I was able to take him to the doctors but I had to leave to return to work, so my mother stayed with him. Soon after my shift ended I checked my phone to see I had several messages from his doctor. I immediately called her back and I was told to take Ayden directly to ER. I called my mother and had her meet me at St. Dominican Hospital in Henderson, NV. I got to the hospital a little before they did, so I waited anxiously for them to arrive. As my mom pulled up I rushed to the car to get Ayden, no one has told me anything at this point besides to take him to the hospital. I opened the car door and Ayden was in his seat, looking very weak and pale. I ran into ER and as I approached the check-in desk Ayden’s eyes began to roll behind his head. I began to panic and the doors opened to the ER, I ran towards the doctors, and the doors shut. Little did I know this would now become our new home? The doctors told me that Ayden had phenomena, and due to the phenomena, fluid had built up in his lungs and collapsed his whole left lung. He was only breathing on one lung. The plan was to go straight to surgery and insert a chest tube to drain the fluid. I waited eagerly in the surgery waiting room for my son to come out. I could not even believe what was happening. An hour or so later the doctor takes us to recovery and there lays my sweet angel; he looked completely lifeless, with tubes everywhere. I never saw that doctor again after that night. Three more chest tubes followed this surgery and the fluid would not stop building up. I would stay every night with Ayden and leave in the days to go to work. I remember one day Aydens IV came out and blood got all over my shirt and I just went back to work full of blood. It was like I was just in a daze. I could hear people but couldn’t comprehend anything going on. We spent two weeks at St Rose Hospital, before I was finally told that my son had Cancer. They had found blue cells in the fluid they were draining from his lungs. The diagnosis was Stage 3 Alveolar Rhabdomyosarcoma. I remember looking at Ayden and just crying. How could I have waited so long for this little boy for this to happen? That night I held Ayden all-night and cried. Ayden could feel something was wrong, and I think for the first time in our life since he came to this earth we experienced sadness. Ayden was only 13 months old. We had just had his 1st birthday party. My life completely shattered to pieces. There is never a way to be prepared to hear that you have a sick child. Life as you once knew it would never be the same. As a single parent it is impossible to go through a situation like this alone. The day after I found out Ayden had Cancer I was let go from my job. So now I had no job, and a very sick little boy, and no idea what to do. Ayden was then transferred to Sunrise Children’s hospital. We stayed there for another two weeks to make sure Ayden’s heart was ok. The fluid that had built up on his lungs pushed his heart out of place. It was one of the hardest moments of our life. All I could feel was fear, and pain watching Ayden go through procedure after procedure. I knew that I could not do this alone. So our family decided to pack up everything in Las Vegas and return to California to live with family. After a month in the hospital the doctors told us what the plan was, 47 weeks of chemotherapy, and if possible surgery and radiation. My sister’s house is two hours from CHLA. With traffic it could take up to 3-4 hours to get to the hospital. We initially stayed at the Ronald McDonald house when we first arrived, but that was even hard to do alone with a 13-month-old child. Ayden started chemo right away and the first night was like something you see in a horror film. He awoke screaming to the top of his lungs, throwing his body back and forth, nothing like I ever saw. Ayden threw up profusely for days. He stopped eating, and started loosing a lot of weight. Soon after his hair started to fall out. We did this every week with one inpatient a month. Our life was now filled with hospitals, over priced hospital food, unbelievable parking fees, and tons of doctors. When we weren’t at the hospital, we were home hiding from anyone who could get Ayden sick. Every day Ayden hasd medications, or shots, or some kind of medical procedure we have to complete even at home. Ayden and I did our best to make the most of it. We played in his hospital room; we went to the playroom when he wasn’t on isolation, and even the outside park when he felt up to it. Ayden loved to stand in the window seal and look at the city. In a way it made us feel like eventually this would pass and the possibilities would be endless. Ayden went to ER over 20 times in his first round. He had several blood and platelet transfusions, two port surgeries, and many other awful side effects. My heart was broken, and my life in shambles, but Ayden kept me alive and hopeful. He smiled and played through the whole process. Ayden has a way of stealing your heart and bringing joy to any room. Ayden completed 47 weeks of chemotherapy. We threw him the best “No More Chemo Party” possible. It was finally over. We had one more scan to confirm the tumor was gone and then we would be free. Free from doctors, free from hospitals, free from Cancer. I just wanted to get back to our life, back to work, back to daycare for Ayden. So we did, Ayden went back to daycare and I finally found a job. It seemed like things we finally looking up for us. Ayden had his scan in the beginning of September. I received a call from the Radiation nurse letting me know that we needed to do another bone scan. I knew this wasn’t good. This wasn’t part of the initial plan. So I called the doctor right away. And again I could have never imagined it would happen again. Not only did he still have the original tumor in the plural lining of his lung, he now had two. We did the bone scan to find that it had not spread outside of his lung, thank goodness. So now here we are today going into our second year of chemotherapy. Ayden will do 47 more weeks of Chemotherapy and possibly more if they are not able to operate again. This is Ayden’s story through Cancer; we do not know when our story will end. We have accepted that this is what god has chosen for us and we will get through it. Ayden is my only child and I will go to any measure to fight with him to save his life. I would never wish this on anyone and this is my inspiration for my Foundation. 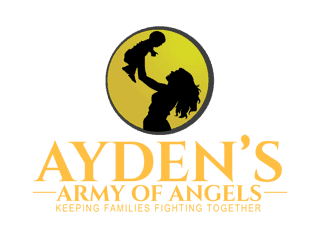 Ayden’s Army of Angels is organized in honor of Ayden and our Journey. We want to, “Keep Families Fighting Together”. No mother should have to choose between being by her child’s side and paying the rent. The best treatment for a child is to have their parents there to comfort and love them. I have spent a year looking for any resource possible to get us through this nightmare, and there have been very little available. Its like everyone else just moves on and forgets. I want to make a way for parents to focus on their child and their recovery. Providing housing, food, grants, and support through our foundation. A lot of these parents don’t know how long they will even have with their child, so imagine having a limited time left and still having to leave to work. Although my life and my family’s life stopped with Ayden’s diagnoses, the rest of the world keeps moving on. I am not sure what the future holds for Ayden and me but I do know, I will never stop fighting for my son, Cancer won’t defeat us.